We hear this question all the time. In the rest of North America, bones conjure up fear, are used to scare children, and no good christian-minded soul wants to be reminded of death. 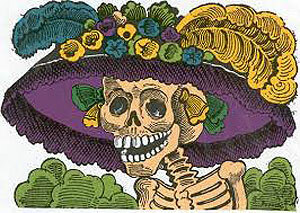 Then, here they come to Mexico and find skeleton figures in all the art and artesania shops. There’s even a children’s cartoon named Huesita, or Little Bone. Why? part they were put to work. Over the centuries, the cultures of conqueror and conquered have melded in fascinating ways. 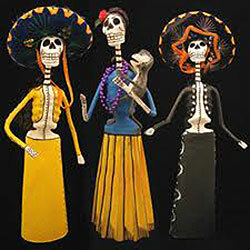 One of these ways is the celebration of Dia de Los Muertos, a two day festival honoring our ancestors. Every year our departed come to visit, to feast and party with the living. The next day all go to the cemetary, where the party continues into the night. Then the living go home, and the dead await the next year. Though the Catholic church was able to move the date of this celebration to coincide with All Saints Day and All Souls Day, this is where Christian influence mostly stops.
! It’s good to keep in mind that most of the cultures of Meso America were interrelated, the same ball courts can be found in ruins near Phoenix as are found on the Yucatan peninsula. They also shared their religions. An integral part of that religion was the depiction of many gods as skeletons. Skeletons were considered good luck and were a symbol of fertility, the dicotomy of life. The god Quetzalcoatl was said to have stolen bones from the the god of the underworld to create the different races of mankind. It was believed that the god Mictlantecuhtli and his wife presided over the world of the dead. They are always portrayed as skeletons. This helps to explain the use of skeletons in the Dia de los Muertos celebration, and why we see them so often in ordinary life. In Mexico, bones are simply not something to be afraid of.